Ladies, gents and connoisseurs of all things good... there’s a new Whiskey collective in town that’s set to surprise and please our Whiskey senses and that it does. Whiskey Union proclaim themselves as a creative collective of Whiskey makers, visionaries and hedonists in pursuit of unconventional blends and extraordinary flavor sensations. While the established brands craft the Bentleys and the Jaguars of Whiskey—which is all fine and dandy—the fellas at Whiskey Union choose to break with convention, experiment with flavor and tread on the sporty side of things; they manufacture well-tuned Ferraris, so to speak, to keep your taste buds on the edge and your belly humming. Boxing Hares is the second of the three unconventional expressions they’ve released so far, the other two being Smoky Goat and Huxley. Now… who would you root for if Scotch and Beer faced each other in a ring? Let us tell you that there are no losers here only the one winning combination. Pete Brewin, a master distiller at Whiskey Union, decided to mix Scotch with the hops from craft beers (Hallertau, hops commonly used in the making of German pilsners; and Cascade, a variety that adds a distinctive bitter note to the American craft beers). The result is a distinctive Scotch sporting a creamy sweet character that is masterfully complemented by the fruity freshness of the added hops. 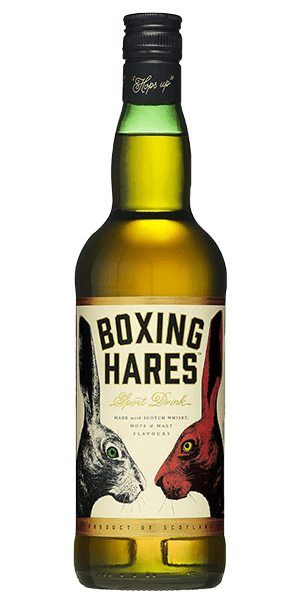 Boxing Hares is a toast to springtime and life itself, an easy drinking Scotch with a refreshing taste that can be mixed with a lemonade, tonic or ginger beer into a long drink or serve short & sweet with lime as a shot. What does Boxing Hares taste like? The Flavor Spiral™ shows the most common flavors that you'll taste in Boxing Hares and gives you a chance to have a taste of it before actually tasting it. Vibrancy of the hops mix, tropical fruits, green citrus, sweet honey and grain. Hops, malt, toffee, pineapple and cherry. You know how you always thought Scotch should be poured over a pint of flat IPA before sipping? What's that? You have taste buds and anything remotely resembling a palate and that sounds absolutely terrible to you? This is the worst thing I've ever put in my mouth. I literally do not ever waste alcohol and I couldn't even suffer through an ounce and a half of this. I wouldn't use this to sterilize medical equipment because the contact would probably reintroduce the plague. Dear God, I can still taste it. What did I do to deserve this? Why? Who greenlit this abomination? Terrible. Just terrible. One of the worst things I've ever tasted. How do I get a refund and compensation for putting myself through this? reading others reviews, typically I'd agree. I'm not a sweet whiskey, sweet wine, sweet spirits kind of guy. The 1st sip, I was overwhelmed by the sweetness. After letting it settle in, it won me over. I absolutely loved it, went to buy a bottle to be disappointed it wasn't available, but quickly threw in the wish list. Surprisingly sweet. Was surprised by this one in a good way. Much different, but better than I expected. This is an easy, pleasing sipping whisky. Really enjoyable, unique enough to surprise and tasty enough to have another! Very sweet spirit. Maybe a good one over ice or in a tea as the compliment for a nice toddy. Not for me. Maybe targeting women. Has a sweetness to it that I don’t think belongs in in a whisky. The label is very nice. Too sweet for me. More of a cocktail whisky. Tasty enough, but a little sweet to drink much of. Too fruity tasting to be a regular drink but might be nice to have a bottle around for an occasional tipple. Smells just like a great beer, then tastes an awful lot like a dessert sherry. The idea of a dessert whiskey never quite occurred to me - but this would be it. Definitely unique - but probably not something I need to try again. Very sweet. Not a flavor I would typically want. Good otherwise. When your in the mood for something a little different, this is it. Very enjoyably sweet. I decided to taste this one night shortly before going to bed, it was the perfect sip. Sweet, but not like a Cordial. Also, very smooth, the only I think is it could be a little higher %ABV. It is not what I was expecting in a whiskey. This would definitely be my choice for a dessert whiskey. I now have a new drinkable dessert. A pleasing assembly of flavors. They called it unconventional and it is definitely that. After the first sip of this whiskey I felt scammed and thought this isn't whiskey at all! After the second sip I became confused and finally delighted. Really unusual and absolutely delicious. Creative. Really didn't get a lot of hops. Very sweet. With eyes closed it could be cognac. Lightly, sweet, which is unusual for a whiskey. I definitely get vanilla, caramel, and a hint of hops. VERY SWEET! Good if you're a sweet tea drinker (or soda) meanwhile I'm neither. Still drinking my sampler but this is my finale for the night and I'm struggling through it. It'll be good if you plan for the sweetness but I personally started on Jameson and it caught me off guard. A bit sweet tasting , but lovely anyway. A surprise to the palate, sweet and smooth like a 25-year-old single malt. I don't know how they did it, but I'd buy a bottle or two. Smoother and sweeter than I would have thought. Not great but not terrible.